The Jail is a Civic Building that increases the number of Jail Cells in your city, improving the performance of Police Stations in high-crime cities. 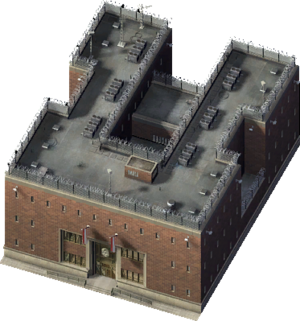 The Jail is the most expensive Crime facility in SimCity 4 and only serves to provide more cells to hold criminals. It's not needed in most cities as the number of cells provided by your police stations will usually be enough, but in particularly high-crime cities you may need additional cells, the service the Jail is designed to provide. The Jail does not provide Police Protection in your cities, nor does it provide any dispatchable vehicles. In Cell Count, it is positioned above the Deluxe Police Station and below the Federal Prison. However, the Deluxe Police Station is much cheaper and provides Police Protection and the Federal Prison, although it is a Business Deal and requires you to run your city at a loss, can hold three times as many inmates and generates an income. This page was last modified on 5 February 2014, at 14:58. This page has been accessed 10,891 times.